A small hill town located at a small distance of 15 kms from Kalimpong and 28 kms from Lava, called Algarah is known for one of the best birding spots in West Bengal as well as India. Here lies the remains of the ancient Damsang Fort. According to the locals, in the year 1960, Lepcha King Gyabo Achuk built this Damsang Fort with the help of spirits who brought the big round smooth stones from the Reshi River. At one point of time, the Fort was used to ward off the forces of the British East India Company. On 20th December, every year, Lepchas from the nearby villages come to celebrate the birthday of the King. The locals lives mostly on agriculture, milk production, floriculture and in recent times tourism. The place have an ATM, Medical Shop, a reasonable enough market and experts suggests that before proceeding to high altitude Silk Route, one should acclamatize at Algarah for a day or two. On September 2014, the Chief Minister of West Bengal announced that the state government was planning to build a "New Darjeeling" close to Algarah in Kalimpong subdivision to attract more tourists to north Bengal. The place has a wonderful backdrop of paddy fields, valleys, pine and dhupi trees with stunning snow capped mountain peaks. The Altitude of Algarah is 5840 ft ASL and the population is around 3000. 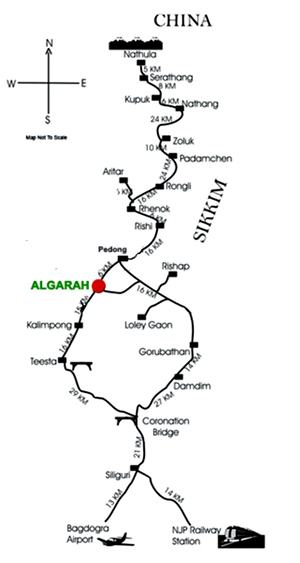 Algarah is geographically important too as it connects the Kalimpong Subdivision, the Silk Route, the Lava Lolegaon Rishyap Kolakham circuit and adjoining state of Sikkim. At Algarah, Nepali is the most used language along with Bengali and Hindi. The main attraction of being at Algarah so far has been birding. The road from Lava to Algarah is well known to birders across India. The place provides unique bio diversity which attracts a sizeable species of birds to nest and breed here. During winters, high altitude birds migrates to this area too. Jhandidara: This view point is ideal for short trekking and bird watching. One can have a view of widest range of Kanchanjunga along with the river belt of Rangpoo. Located at a walking distance of about 30 minutes from Algarah. Sample Dara: This view point offers the exotic 360 degree view of valleys, Nathula range (SIKKIM). This point offers a view of seven valleys at a time. Located at a walking distance of about 10 minutes from Algarah. Sunset point: At a walking distance of about 7 minutes from Algarah, this point offers the mesmerizing view of sunset in the valleys. Water Reservoir: Rested in the lap of Mother Nature, this water reservoir is one of the biggest in Kalimpong subdivision. Located at a walking distance of 10 minutes from Algarah. Damsang Fort: Built in 1690 by Lepcha King Gyabo Achuk, and destroyed in 1864 during Anglo Bhutan war, the Ruins of Damsang fort tells the story itself. Located at about 5 km from Algarah. Rikkisum: The Golden Crown Point of Algarah, the name comes after the golden view of Kanchanjunga at the time of Sunrise. This view point is located at about 5 kms away from Algarah. Zambala Guest House, is located in Algarah (New Darjeeling), 15 Kms away from Main Town Kalimpong. Algarah has got the view points at the walking distance which offer the views of Kanhanjunga, Sunrise, Sunset, Bird Watching, Short Trekking etc. Algarah is rich with the historical places like "Damsang Fort", "Rikkisum", "Jhandidara" etc. In Short Algarah has everything that a tourist desire for. Zambala Guest House has got six wooden furnished rooms with attached toilet and bath with geyser fittings; Cable TV Connection available. 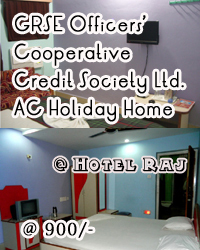 Five Rooms are double bedded and one is three bedded. In house laundry and dining facilities are available. The Guest House serves Indian, Chinese and Continental Cuisines. The Tariff varies from Rs. 800/- to Rs.1300/- .